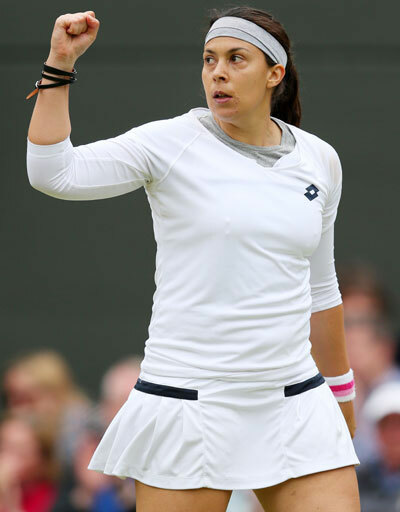 An improbable scenario that would have prompted a polite chuckle among tennis fans two weeks ago is set to play out on Thursday when Marion Bartoli, Kirsten Flipkens, Sabine Lisicki and Agnieska Radwanska do battle in the Wimbledon semi-finals. The odds on those players making the last four were 33,379-1 at the start of the tournament but the early departures of Maria Sharapova and Victoria Azarenka opened up the draw and Lisicki knocked out defending champion Serena Williams in the fourth round to blow it wide open. Lisicki, the new favourite and bidding to become Germany's first Grand Slam singles champion since Steffi Graf in 1996, will take on last year's runner-up Radwanska. Awaiting the winner in the final will be French 15th seed Bartoli or Belgian Flipkens, a woman who has defied medical advice to continue a tennis career that came close to being destroyed by injury and illness. Nicknamed "Flipper", she was languishing at 262nd in the world a year ago, after suffering blood clots in her legs that put her at risk of a pulmonary embolism or thrombosis. She said she felt tired after a flight from Thailand and went to have it checked out before heading on to Tokyo. "The doctor told me that if I had taken the flight I would have come out blue," she said. Her fightback has been nothing short of extraordinary. Her freefall down the rankings left her in the tennis wilderness where she was not even deemed good enough to play in the qualifiers for last year's competition. 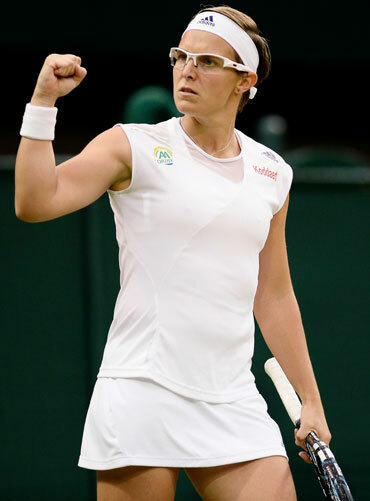 Flipkens became the first Belgian to reach the last four at Wimbledon since Justine Henin in 2007 with a three-set victory over former champion Petra Kvitova. Now all that stands between her and a place in the final is Bartoli, the 2007 runner-up to Venus Williams, whose punchy groundstrokes are tailor-made for grass. The Frenchwoman came through a bizarre rain-interrupted quarter-final that featured eight successive breaks of serve. Lisicki is now tipped as the player most likely to lift the famous Venus Rosewater dish. Having ended Williams's hopes of a sixth title in arguably the biggest shock of a tournament filled to bursting with surprise results, she beat unseeded Estonian Kaia Kanepi in just 65 minutes to reach the last four. Lisicki's career has also been dogged by injury -- she dropped outside the world's top 200 in 2011 -- but she is a potent force on grass. She possesses one of the fastest serves on tour and her Wimbledon record contrasts markedly with her performances in the three other Grand Slams. She has a 18-4 record in singles at the All England Club compared to 16-15 at the Australian, French and U.S. Opens. Lisicki reached the semi-finals in 2011 before losing to Maria Sharapova, but is feeling more positive this time around. "I think this time I'm more ready," she said. "I just feel like I'm hitting the ball well. I think I'm moving well. I feel good. "And having had the experience in the past, all that together helps me a lot." Lisicki's semi-final opponent is no novice. Radwanska reached the final last year against the odds and surprised many still further by taking Serena Williams to three sets when everyone was predicting a mauling. She is the highest remaining seed and shuns the hard-hitting muscular tennis that currently dominates the women's game for a more cerebral and wily approach.